SWOP is a town-based program on the Iron Range in Minnesota. It has been in existence since 1998. 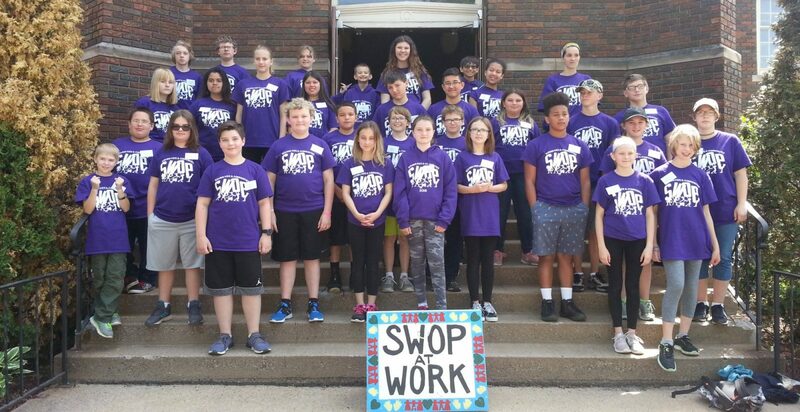 SWOP “hires” teams of 11 to 14 year olds for its six week summer program of teaching life skills through community work, community service, community guest speakers, and adult mentoring. Youth learn money management through receiving a weekly stipend. SWOP maintains a high adult to youth ratio of about 5 youth to 1 adult. The program has been in existence in Mt. Iron and Buhl since 1998. Chisholm joined in 2007 and a fourth site was launched in the community of Virginia in 2012. In 2018, Mt. Iron and Buhl were combined into one site and a new site was added for Eveleth/Gilbert. All youth help out at the AEOA Senior Carnival. The whole of SWOP is about life skill development. Every specific skill that is presented gets reinforced through the work and interactions of the day. Guest speakers from the community may relate to the specific life skill being presented each week, or their topic may simply expand community awareness. Learning to introduce oneself to guest speakers, as well as listen to, and interact with them is itself a primary area of life skill development in SWOP. Youth helping out in Northside Park in Eveleth. The primary purpose of SWOP is its impact on the youth who participate. Although it is impossible to measure this impact (especially without long term contact), throughout the program we build in opportunities for the youth, the staff, and their peers to set goals for their own development, affirm their contributions and assets, and evaluate their progress.